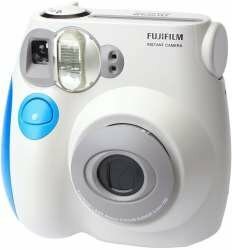 New camera owners would love how easy and comfortable it is to use the Fujifilm Instax Mini 8 camera. It is also slimmer than the Instax models before it. Those who feel nostalgic looking at Polaroid cameras will enjoy this point and shoot model as it takes instant pictures and develops them right away. It’s even designed like a toy camera in blue, white, yellow, pink, and black,. It lets you choose from 5 exposure levels with a shooting range of 0.6 to 2.7m and always-on flash. If you feel like carrying around a retro analogue camera with chunky lens, matte plastic finish, and big buttons, the Instax Mini 8 is the camera for you!